I recently had the great pleasure of having an extensive 2-hour interview with Taiwanese award-winning director of LOVE Talk 幸福定格 (see below for synopsis) Mr. Shen Ko-shang 沈可尚. after watching his new documentary (spent 7 years to film 8 couples) which I really enjoyed and found insightful. 最近慶幸有機會訪問台灣得獎導演沈可尚兩小時，詳談他非常好看及發人深省的新紀錄片”幸福定格 LOVE Talk” (七年時間拍攝八對夫妻) (影片簡介見文章末). Ko-shang was very accommodating in letting me asked questions in English (with some Mandarin translation when necessary) and then he answered in Mandarin. Since Ko-shang gave some very broad, in-depth, very insightful and sometimes unexpected answers, I wasn’t sure if it is useful or unhelpful to break the Q&As down and provide precise time codes to help viewers access a specific section. My suggestion is to watch the whole interview from beginning to end so it flows better. But if you must, see below for linked time codes and my questions. 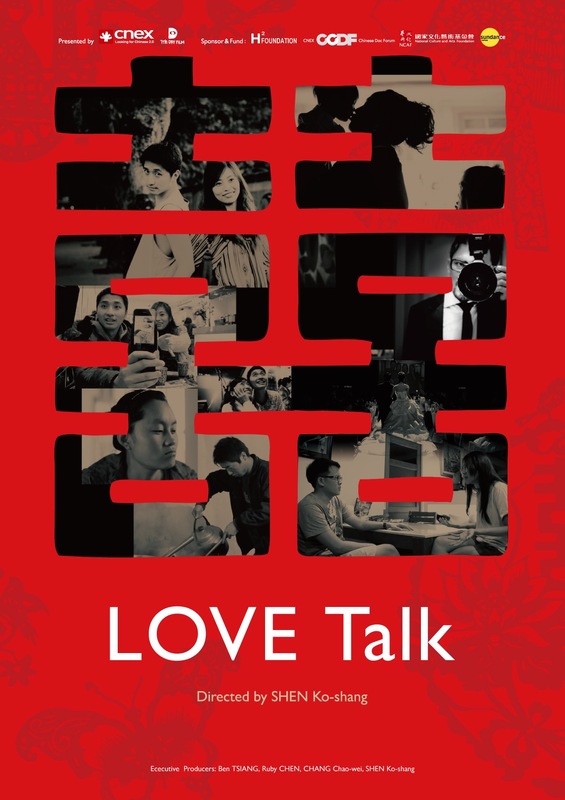 Question @1m45s I heard from a HK organizer of Chinese Documentary Festival (第十一屆華語紀錄片節) the first screening of “Love Talk” was sold out on the first day of ticket sales. And the second screening are almost sold out. So they added a third screening. How do you feel when hearing this good news? Do you feel pressure from anticipation of the audiences? Question @3m52s Are you looking forward to Q&As with HK audiences? Can you talk about what did you try to capture in the beginning and what did you get at the end? Question @14m07s So it took 14 months to make: 賽鴿風雲 RACING PIGEON IN TAIWAN, 3 years to make: 築巢人 A Rolling Stone, and now 7 years to make 幸福定格 LOVE talk filming 8 couples. How did you feel during the 7 years of filming and about one year of editing? Were you very worried about not getting what you want or need? Question @21m28s When you decided you to start editing, did you ever go back to film more footage? Question @29m03s Are there cases after their chats were filmed, they asked you to delete the footage or promise not to use them? If not, what would you have done if you were asked? Question @37m26s If you had a time machine and could time travel to 10, 20, or 30 years into the future to talk to the grown up children of the couples, what would you tell them? Would you thank them? What would you say? Question @44m11s How did you decide to place the funny moments, the heart warming moments, the tense and stressful moments in the film? In a sense, how did you discover the flow of the film? Question @1h03m14s Since LOVE talk has already screened at film festivals in places like 西寧, 武漢, and 北京, and you’ve Q&As, something I understand you enjoyed. Can you give examples of three memorable audience questions that you were asked and your answers? Question @1h15m20s Some viewers who have watched a promotional clip would have learned one of the women in the movie had stage 3 liver cancer. After rematching the film, I realized it wasn’t mentioned it the movie. Can you explain a little of your reasons of actually NOT giving much details about the couples and what happened to them as some scenes ended mid-argument? Question @1h18m56s My question about naming the film “TALK love” since TALK is so important? Question @1h20m56s In the end of the film, we learned one of the husbands was in HK? Is he still working in HK? And do you know if he plans to attend one of the screenings? Question @1h23m37s German director Werner Herzog is known for making some great documentaries and drama. I love his documentaries: Grizzly Man , Cave of Forgotten Dreams and his dramas like Rescue Dawn. You yourself have made both dramas and documentaries in your career. Can you briefly talk about your processes in coming up with ideas, planning, and making documentaries vs dramas? Do you have a favourite genre: documentaries or dramas? Question @1h33m10s When you write your script, do you have actors/actresses in mind playing those roles? And how do you cast actors/actresses to act in your movies? Canadian director David Cronenberg once used YouTube interview videos to help him cast a movie (Twilight superstar Robert Pattinson in his movie Cosmopolis). Question @1h44m42s What next for you with “LOVE talk”? Which festivals are you scheduled to attend? And will people in Taiwan get to see “LOVE talk” in film festivals or main theatres? Question @1h47m25s What do you look forward in your upcoming trip to HK? What do you like to eat? What do you usually do in HK? Question @1h48m33s Some of your HK friends make documentaries. Do you end up talking shops and each others’ movies with your documentary filmmaking friends? He spent 7 years looking for the secret to the preservation of marriage. Taiwan director Shen Ko-shang, after his first year of marriage, started to question his marital life, and with these questions, he had been shooting 8 couples for 7 years. He invited them to have conversations in front of the camera, while the topics ranging from their in-law issues, children upbringing problems, to the division of responsibilities in their marriage, in order to seek for the answers to two questions: Do people really need marriage? How exactly do two people get along with each other for a lifetime? *) Ko-shang did an insightful and fun to listen to hour long interview with 人氣心理專家鄧惠文 (精神科醫師/心理治療師) on her radio show. You can listen to the full News98 radio show on YouTube. This entry was posted on Wednesday, September 26th, 2018 at 9:26 AM and is filed under Documentary, InterviewByKempton, InterviewByKempton-Arts, movie review, Movies, Taiwan, YouTube. You can follow any responses to this entry through the RSS 2.0 feed. Both comments and pings are currently closed.